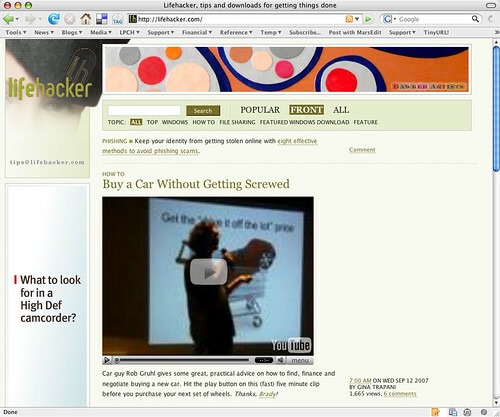 One of the Ignite Seattle videos I produced was featured on Lifehacker this AM. Rob Gruhl’s preso on “How to Buy a Car without Getting Screwed” is a perfect example of why I spend time capturing these snippets of community gatherings. It’s such a treat to watch these things take on a life of their own and make their way to where they want to go (instead of disappearing into the ether). Thanks to Rob for the presentation and to Brady, Bre, Jessie, and O’Reilly for the opportunity to craft cool community experiences like this.